This wasn’t the dream I had for myself; parenting a baby for a couple days and then being a parent from afar when he ended up passing away. My dream had been very different. From a young age, I had wanted to be a mother, have a family that gathered together for the holidays, and shared memories. I imagined myself with little children who I would teach and raise to be productive, successful members of society. We would laugh, love, and create a family legacy. I believed that you got pregnant, had a beautiful baby, and brought it home. I met my Joel at 25 1/2 weeks gestation. I had suffered pPROM, where your water breaks very early, before term, from a slow leak between 16-18 weeks along (diagnosed during my 18th week). Doctors suggested termination as labor often starts within 2 weeks of ruptured membranes. I held on to hope that he may be among the few babies that beat the odds. I stayed pregnant for 7 1/2 more weeks after my diagnosis. Unfortunately, a uterine infection set in, and I went into labor. I was so scared; I knew he wasn’t ready to be born yet. I was in labor for about 12 hours. It was rough. They put me on oxygen and various IV meds. I was sick from the infection. But he was born, he was alive! When I saw him I fell in instant love. He was beautiful. Everybody commented how he looked so mature for his gestation. Joel looked like a miniature full term baby in a lot of ways. He was trying so hard to breathe on his own. The doctors intubated him and said he did so well he had a 70% chance of living. He was critically stable, and I was thrilled. I had some small complications from the birth, and I was still drugged up. I was very uncomfortable but I dragged myself to NICU. I was proud of my Joel, he was fighting so hard. But his second night in NICU he started faring badly. The doctors asked if they should resuscitate him if he stopped breathing. I was mortified they would even ask, of course they should! But the doctor explained that when you have a preemie so small, CPR itself can permanently damage or kill them. His father and I had decided to walk a fine line. We would do everything we could to save Joel, but not at the expense of his health, quality-of-life, or put him through severe pain. But to tell a doctor not to resuscitate your son is a big step, I asked them for some time to think about it. I went to bed around 1 am on his second day of life. I was so worried and afraid. My boyfriend had gone home to get some sleep so he can try to go to work. So I was by myself in the cold hospital room. The nurses ran in around 5 AM. They said I had to see Joel, he was not doing well and the doctor had barely saved him from completely coding. They needed to know an answer now about what to do if he needed resuscitated. I called Jay so he could head back down to the hospital. We were talking about what we should do when they told me that Joe had coded right then. I could not really run however I rushed to the NICU as fast as I could. I don’t think I ever felt sicker to my stomach. I ran into his room and about six people were working on him. It was such a terrible sight. I looked at Joel’s little face and I could tell he was really hurting from all their efforts to stabilize him. I asked the doctor if she thought they could save him and she said no. I asked her if they were hurting him and she said that to be totally honest they were probably breaking his ribs. I felt sick with dread and the idea of the pain he was in. It was obvious that Joel was in a lot of pain, I would be too if they were breaking my ribs with force. If I had known with certainty that Joel would have been ok I would have continued. But I asked the doctor if she thought he would come back from this, and would she do this to her own baby. She said no. I saw his face scrunch up more and more in pain, and I just knew. My protective mother instinct kicked in. We had to stop the valiant efforts; it was selfish of me to hurt him like this just to keep him with me on earth, and to be inflicting damage on his little body. They stopped working on him, and he was laying there looking lifeless on the little table. It broke my heart! His face was not in pain anymore, it had relaxed. I asked if I could hold him as he passed away. He knew I was his mommy, he had been holding my finger for the last couple days in NICU. I picked him up and held him to my chest. Told him that mommy was so sorry, that I tried so hard and fought to keep him here with us. I told him that Daddy loves you, Mommy loves you, we all love you very much, but we knew he had to go to heaven. I had them take the monitors and wires off because they made me really upset with the random beeping. Plus it was hard to hold him close to me with all those wires. 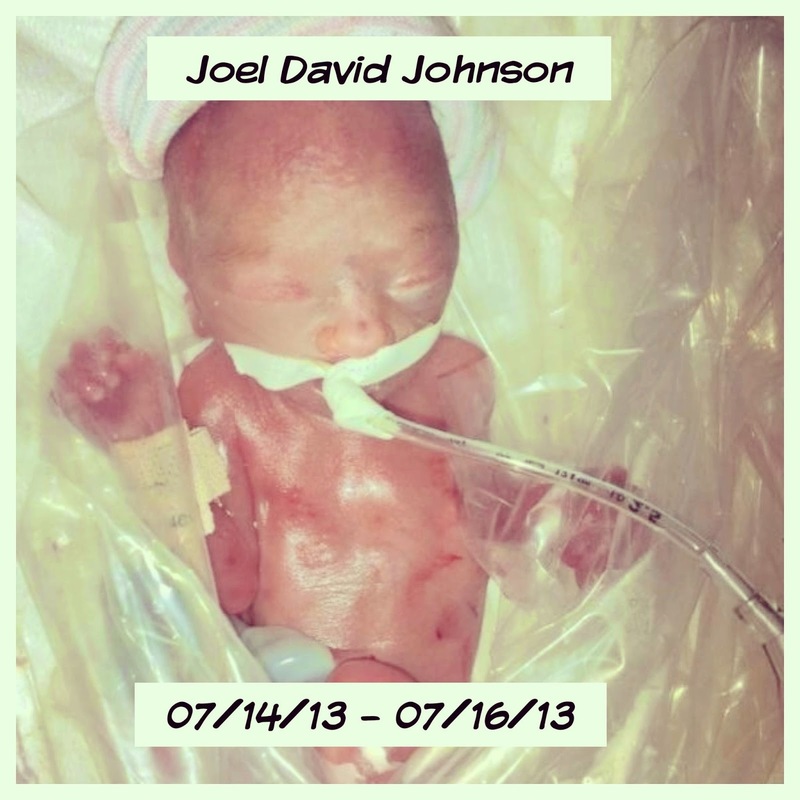 Joel nestled against my neck; he stopped breathing as peacefully as somebody passing away can. Jay had driven as fast as he could to the hospital, but he didn’t make it in time to be with Joel when he passed. It tore my heart out to see the distress and pain he was in at the loss of his son. It’s a memory burned in my brain I can never forget. Shortly after Joel passed away, both of his aunts and his grandparents came to say their goodbyes. The days following the loss of my son are a blur. All the funeral planning, selecting the casket, picking an outfit for him, and writing an obituary; all the minute details you never plan on having to do for your child when you get pregnant. Thankfully we had supportive friends and family that assisted us in our numb state. For days after Joel’s death, his father and I wore our NICU ID bracelets as we were unable to bring ourselves to take them off, our last link to him. There were many nights of tears, nightmares, and asking God why us; two people who deserved to be parents, who would have loved their son. He had been wanted and loved by so many, his funeral was packed out. I had to return to work and face the numerous customers who asked, “How’s the baby?” They were only aware I had been on maternity leave. With time, the fog lifted slowly and new challenges were faced. Jay and I grieved differently. Ultimately that drove us apart, and our relationship ended. My whole world was thrown into chaos. I had always comforted myself with the thought that I may have lost my son, but I still had my partner, his handsome father, who I loved with all my heart and would have followed to the ends of the earth. When I was stripped of all my hopes, dreams, and the future I had envisioned, I felt like I had nothing left worth living for. Slowly I got my feet back under me. The world had altered, my reality had shifted, and I had faltered at the edge of despair. But I began to look for hope and joy in the little things. I joined a gym, kept myself busy, and began to find a way to care about life again. Now I am 1 ½ years into my journey of grief. There are still days its super tough. Joel is never far from my mind, and my heart bears the constant ache of his loss. You don’t “get over” the loss of your child, you simply learn to adapt to it. I share Joel’s story whenever I can and still consider myself a mother. I did a walk in his memory recently and wore a shirt with his footprints on it. I still sometimes play the “what if” game. What if Joel had lived, would his father and I have stayed together? Would we have been the family we had imagined we would be? Would I be happier with my life than I am now? Of course, I will never know. However, what I do know is this new kind of “normal” I have found. I learned to let my own experience of pain make me more aware and sensitive to the suffering of those around me. I may not be learning lessons from my son while raising him, but he has taught me more than I could have imagined; how to truly love, and how to find hope after tragedy. Chrissy Storr lives in sunny Arizona. She attends college and is almost done with her nursing prerequisites. 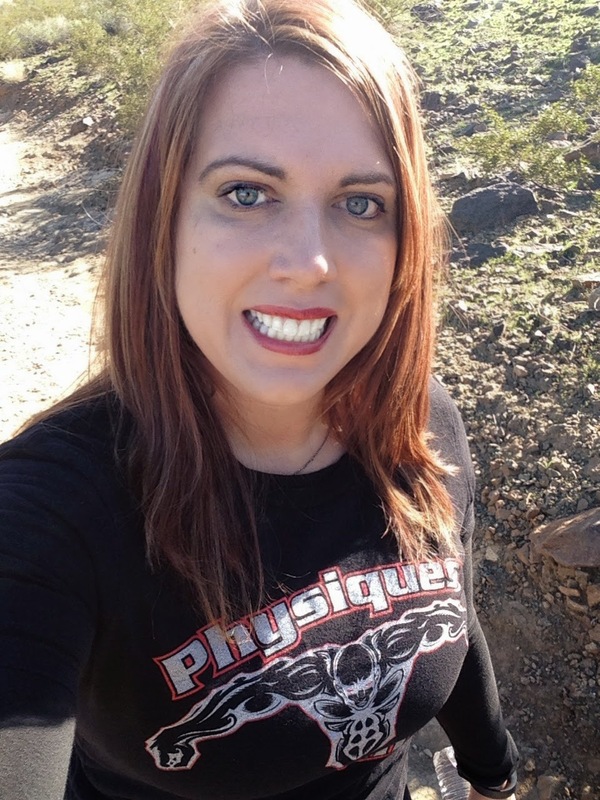 She also is a seamstress, and has become passionate about being healthy. She can be found at the gym on a regular basis and has completed a few 5ks in the last year. She loves sharing about her son, Joel, and is an admin for a support group that offers assistance to mothers suffering from pPROM. Thank you for sharing Joel’s journey it’s an inspiration. Aww… coming from a Father how sad Chrissy! I never knew. 😞 That's terrible. So sorry you had to go through such a tragedy. My heart goes out to you. Keep your head up and never give up hope in life. You'll be a great Mother someday. Hugs. Thanks! I'm glad you liked it. I love to share about my Joel and how I've learned to live a fulfilled life since.